Fun & Inspiration 6 Boys Decided To Carry The Body Of Someone They Never Knew, Their Reason Reminds Us To Do Good. 6 Boys Decided To Carry The Body Of Someone They Never Knew, Their Reason Reminds Us To Do Good. 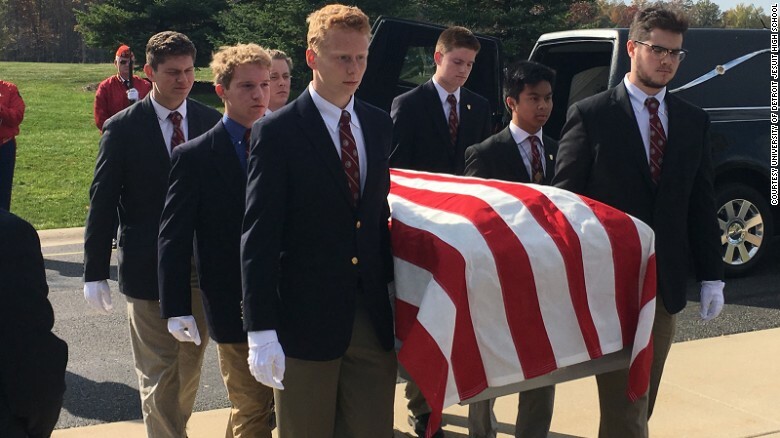 6 students from University of Detroit Jesuit High School have come up with a unique way to honor our nation’s fallen heroes: serving as pallbearers in unclaimed veterans’ funeral services. The idea originally belonged to high school Senior, Joshua Gonzales. It started off as a way to give dignity to Detroit’s homeless population– the boys planned to volunteer at funerals for homeless individuals– but, as more students gained interest, the job became more specific; the students decided to become pallbearers for homeless veterans whose bodies went unclaimed. 6 boys served as pallbearers for 3 veterans. The boys inspired their classmates, and now a total of 50 boys have been trained to continue serving this need. The thoughtfulness of these young men is simply incredible. What a gesture of love and respect to those who have served this country. Share these students’ act of kindness today!